Image courtesy of Thanks to Ed for the tip! Thanks to Ed for the tip! While it may look like something slapped together in an Intro to InDesign class, this vegetable oil packet from Subway makes for a good demonstration on how to obscure information you need to include but don’t really want people seeing. 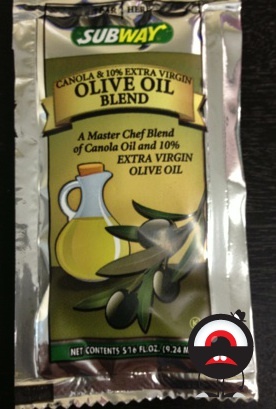 There’s the obvious size differential, with the most prominent words on the packet being “OLIVE OIL” in large type in the center of the arced ribbon. Below these words, in significantly smaller but still noticeable type, is “BLEND,” which may cause some to wonder what the rest of the stuff is. The real master stroke is in the text that fills the appropriately olive-green background, located above the image of olives and to the right of the drawing of the corked container that presumably contains olive oil. We’re not saying that what’s going on here is wrong or insidious. After all, the information is all provided to the consumer. But it helps to occasionally point out the ways companies play with design to trick your eyes into seeing what the company wants you to. Butter Can Be Bad For Your Health, Concludes Study Paid For By Dairy Industry. Wait, What?